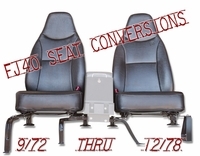 A CCOT Exclusive 40 Series Seating System... Seats, with accessories are sold in pairs... CCOT seat conversion system is sold and developed exclusively by CCOT. Seats are high quality Bestop Hi-Back fixed (see red FJ40) or reclining (pictured below) black vinyl seats that come complete with adjustable seat sliders for both driver's and passenger's side to allow maximum leg extension / room. Seats / sliders mount to CCOT's Exclusive seat conversion plate system. 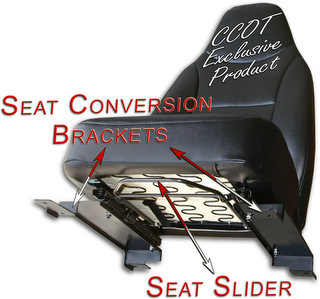 CCOT's conversion plates allow a perfect installation of Bestop's bucket seats to the original Land Cruiser factory seat risers. 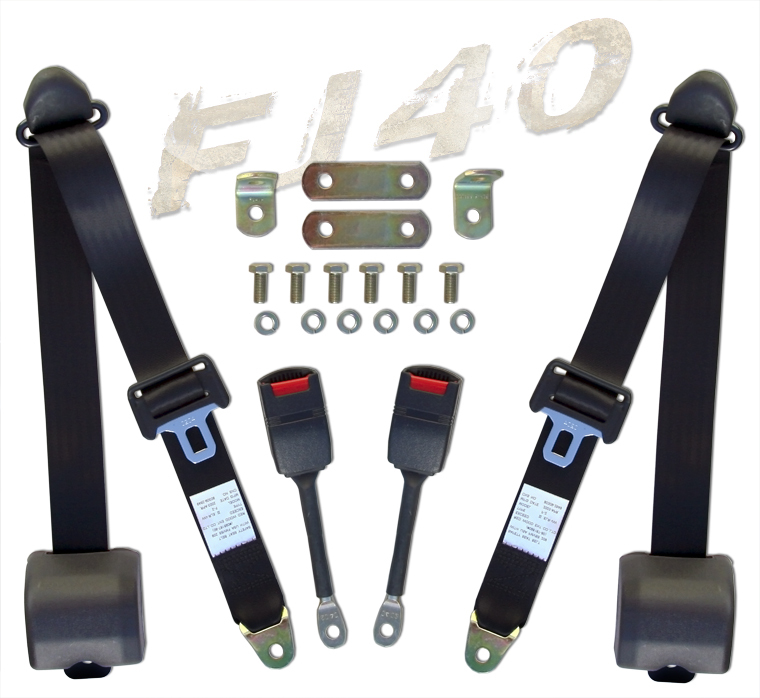 To complete the system, seat conversion kit also includes new 3-point shoulder harness seat belt system (Optional, prt# S013021) and all necessary mounting hardware. 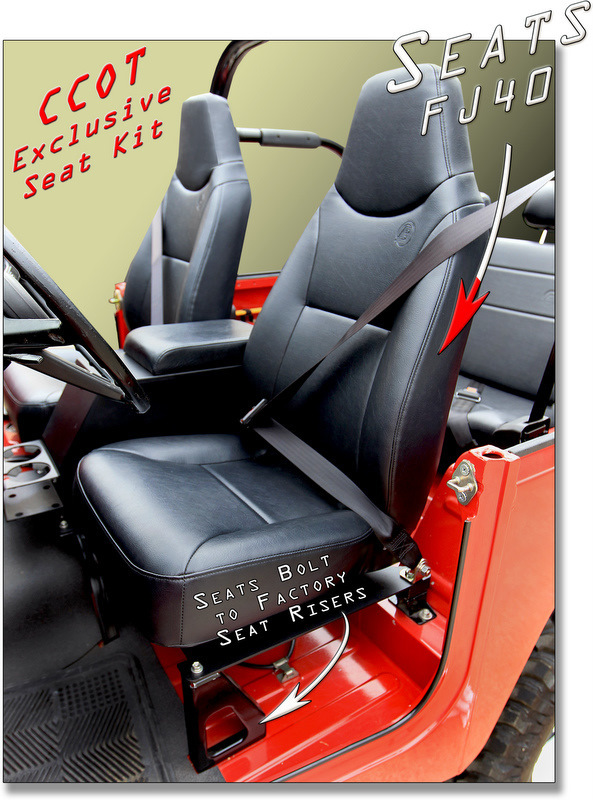 This Front bucket seat system is a simple bolt in installment to your factory seat risers (required). 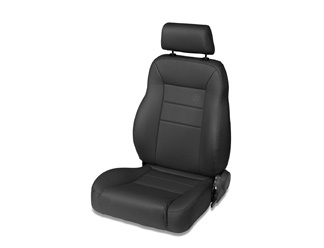 These seats are designed for US delivery land cruisers that originally had bucket seats not the 60/40 seat combo. 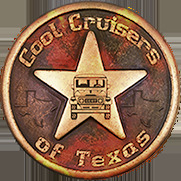 Seat Kits Fit - FJ40, BJ40 and BJ42 Land Cruisers with production periods 9/'72 to 12/'78 and 1/'79 to 1984. Note: Order Seat Risers separately, if needed. Select bucket seats in Black or Charcoal. Charcoal is ONLY AVAILABLE in reclining seats. 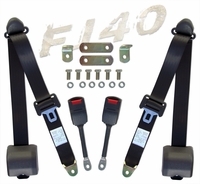 Note: System will add $134.93 to base price for Seat Belt / Shoulder Harness kit, if selected. System will add $290.59 to base price for reclining bucket seats. CCOT contracted a square tubing fabricator to build a replica set of floor to seat risers to fit FJ40s, 1978 and older. CCOT's seat riser kit will match perfectly the original captive nuts in the floor of FJ40 (9/72-12/78) and bolt perfectly to OEM seats. With CCOT's Seat Conversion Brackets and Seat Sliders, all 9/72-12/78 model FJ40s can install a variety of Bestop seats. CCOT's long awaited seat riser conversion kit will revolutionize the comfort and reduce driving fatigue by allowing FJ40 owners to convert to Bestop front bucket seats. Locking retractor for security in the event of an accident. CCOT Seat Belts - Safety with Comfort ! January / February 2013 Article written by Justin Kreutz. Justin takes you step by step through a "Trifecta" of bolt on FJ40 modifications that includes converting stock seat mounts over to Best Top seat mounts, replacing old seats with new and finally, Justin installs new 3-point belts for safety.